The tunes and songs recorded and compiled on this CD have been selected from almost two decades of Gregor & Stevie's musical history. This CD features a collaboration of musicians performing in a variety of styles each track representing a different era of the boy's musical careers. This CD is an enhanced CD-ROM and contains film footage of Gregor & Stevie performing with The Thomas Tallis Steel Band. Track Listing / Audio Samples: Track 1 and Track 14. The Game's a bogey - NOT!! When I first saw this CD I didn't know what to expect and I never would have expected what I was about to hear!! From the crisp, clean and rapid notes on the accordion to the phenomenal rhythmic feel of "Big G's wee thumb". "Toy Soldiers and egg" features a guest appearance by a well known TV chef - see if you can guess who? 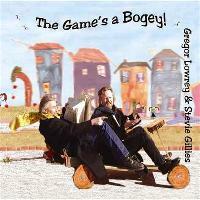 This CD spans over 20 years of music and is a rare opportunity to hear the musical genius of Gregor and Stevie together. This review is from Music In Scotland. How does one describe this, other than excellent? Greg and Stevie play a musical chronology, with each of the seventeen tracks representing an era of the two decades they’ve played together. Quite stunning, both in musicality and breadth, the album includes Scottish traditional, Scottish contemporary, Continental and various other modes, all with enormous verve and style. Guitar, accordion and vocals, plus a whole lot more and it’s an enhanced CD with extras too! You thought Phil Cunningham played fast? Check out the Soft Horse Reel on this then!